Successfully Added Mini 1080P Car DVR - 1/4 Inch CMOS Sensor, 120 Degree View, 1.5 Inch LCD Screen, Rearview Mirror, Built-in GPS, HDMI to your Shopping Cart. Keep you eyes on the road, while this handy mini car DVR will record important happenings and provide you with irrefutable evidence should anything happen on the road. With a 120 degree wide angle, 1080P resolution at 30 frames per second and a convenient 1.5 inch LCD screen, the car DVR has everything needed for a quality recording and efficient performance. 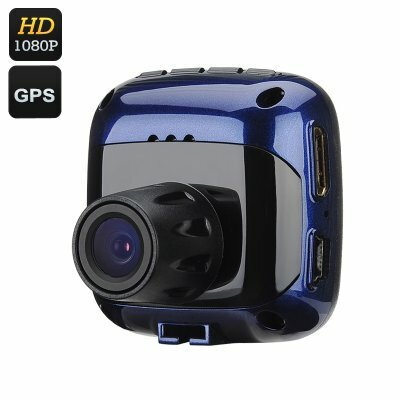 While compact and inexpensive, this mini 1080P car DVR will perform an important function in your vehicle — recording evidence in case of a traffic accident and giving you the necessary proof in case of a road dispute or scam. Equipped with a 120 degree angle, the dash cam is able to capture background events, as well as provide high quality 1080P footage at 30 frames per second. With the built-in G-sensor and motion detection capabilities, the camera will detect any sudden movement and lock the footage, making sure that it’s not overwritten. The 1.5 inch LCD display lets you conveniently review the footage you’ve taken, quickly and easily show it to the traffic police or insurance companies. The footage is stored on a micro SD card — and thanks to H.264 encoding, the storage space is used very efficiently. You can also hook up the dash cam to a large screen via its HDMI port. The Mini 1080P Car DVR comes with a 12 months warranty, brought to you by the leader in electronic devices as well as wholesale car DVRs..